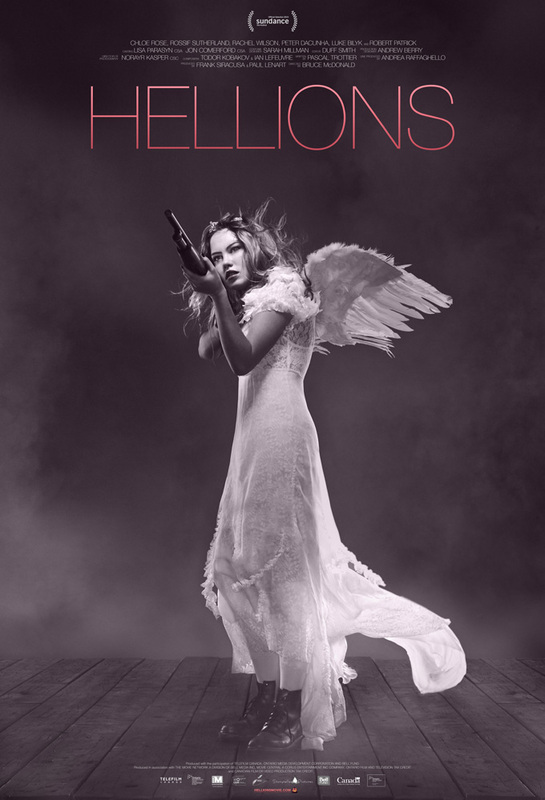 I first heard about Hellions at the beginning of the year when it premiered at Sundance. That doesn’t mean I remember what people said about it back then because the only horror movie that anyone seemed to talk about was The Witch. I also knew that Hellions director Bruce McDonald also directed Pontypool and that movie rules. Fun fact: even though Bruce McDonald hails from Canada, he is not Bruce McCulloch from The Kids in the Hall. Who would have thought two people from Canada could have such similar names?! Basically what I’m trying to say is that Cancer Boy didn’t direct Hellions. There, how’s THAT for a review? LOOK AT HOW CREEPY THESE LITTLE JERKS LOOK! On Halloween night, 17-year-old Dora (Chloe Rose) learns that she should have been a little more careful with her boyfriend because she’s all sorts of knocked up. Contemplating whether she will carry out the pregnancy and not feeling like partying anymore, she decides to stay at home while her family and friends go out to celebrate the spooky day. While Dora spends her evening watching scary movies, trick-or-treaters begin showing up, but something about the children makes Dora feel uneasy. The mischievous kids start to torment Dora and she quickly realizes she is dealing with something much more terrifying and supernatural than jerk trick-or-treaters. Looks like she’s not the only one planning what to do with her unborn child! LOOK AT HOW AWESOME THIS SHOT LOOKS! Hellions, why couldn’t you have been slightly worse or slightly better? Hellions contains absolutely nightmarish imagery. At times the trick-or-treaters reminded me of Sam in Trick ‘r Treat, a playful representation of the “rules” of Halloween. 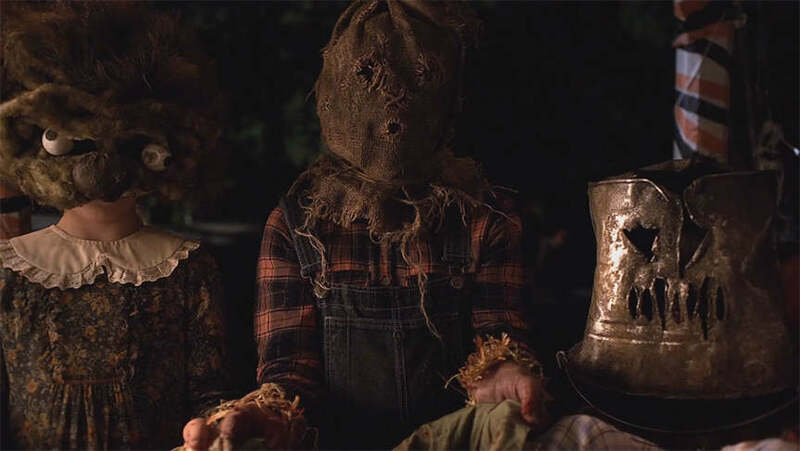 At other times, Hellions reminded me of Halloween in how it explored the idea that these people in masks running around represented something much more sinister than just kids seeking candy. It even reminded me of Halloween III: Season of the Witch and all of the children running around in masks who spend their evening prepared to do the bidding of Silver Shamrock! Sadly, I felt like all of the film’s potential was squandered. Surrealistic colors washed over all of the interesting cinematography, particularly a few shots in a pumpkin patch that had really interesting composition, but a pink hue washed everything out and I felt like I was watching an old SyFy movie. You know how some movies will try to save money by shooting night scenes during the day and then filtering it to all hell? Yeah, like that. Early on in the film, Dora passes by local law enforcement (played by Robert Patrick) and they both express their disinterest in the holiday, but he points out that Halloween keeps the town alive, implying a deep history of….something. Sadly, we never learn what the hell he was talking about, and I don’t think it was in an “Isn’t that mysterious? !” type of way. The film hinted at some larger dark forces at work, but never really followed through on any of those threads for me to care about what was happening. 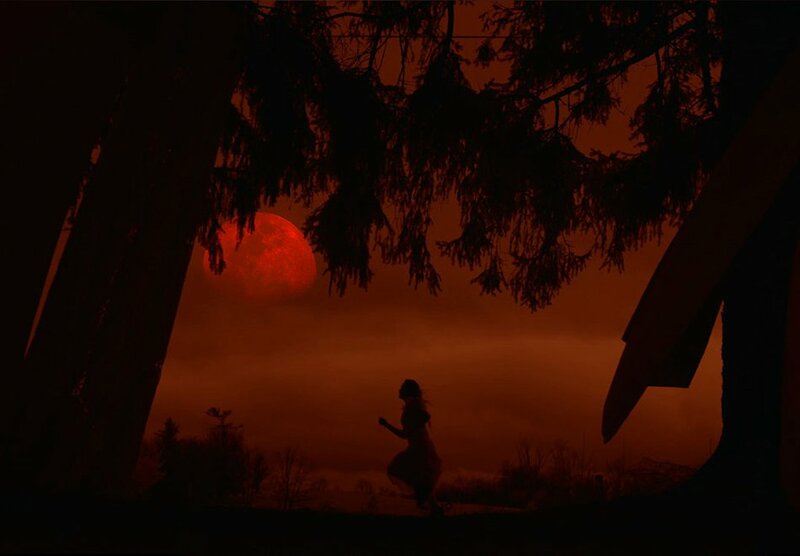 Hellions had a lot of potential and had a number of sequences of pure terror, but ultimately I felt lot the plot never caught up with the compelling imagery in a way that could have a created a more cohesive, Halloween-themed treat. It’s like we were tricked instead!